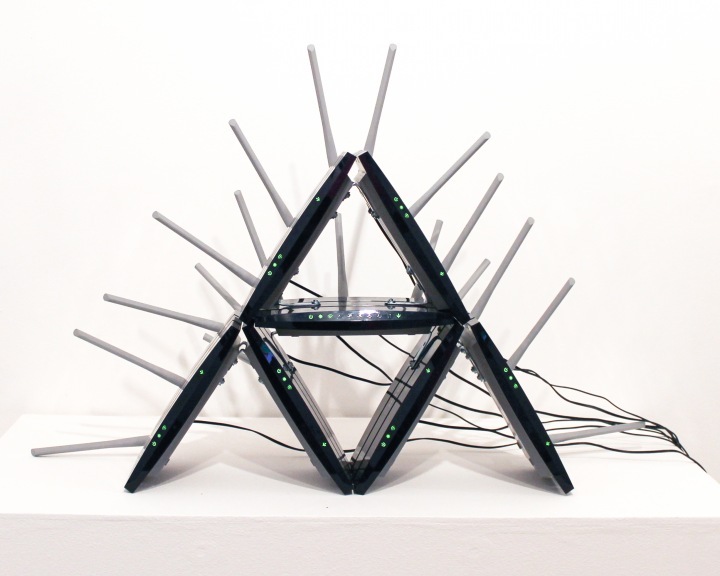 The Kopimi Totem is a sculpture composed of seven open wireless routers arranged in the iconic Kopimi pyramid. The shape of the sculpture is also mirrored in ASCII form when a visitor opens the wireless settings on her laptop or mobile device. The network names (SSID) of each of the routers are arranged by default alphabetically to create a mirrored digital totem within the connecting device's operating system. When visitors connect to each of the routers, they will have access to download archival media (text, images, video, etc) from the 10 year history of the Piratbyrån organization. Kopimi, an idea created by Piratbyrån member Ibi Kopimi Botani, is an alternative to copyright that not only expressly allows all forms of copying, but encourages it. In addition to downloading files, visitors to the Kopimi Totem can also upload their own files, thus contributing to the harmony of the data life cycle of copy (yin) and paste (yang). 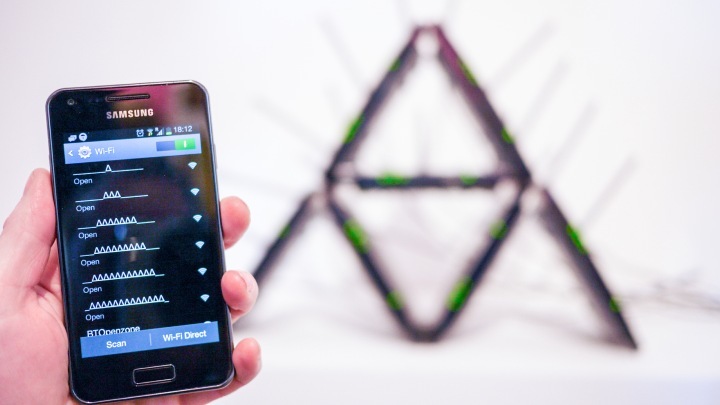 When a visitor connects to all seven of the routers in the sculpture, the network names will be saved ("collected") in the operating system's list of visited/preferred networks, recreating the ASCII pyramid once again and acting as a token of this pilgrimage. Made in collaboration with Piratbyrån. Built using PirateBox with thanks to Matthias Strubel.